Lincoln Tree Farm is best known for its whack-a-mole brush piles. Swaths of logged areas, mapped as light-yellow-tan “rough open area” on the map, are speckled with green dots representing tall brush piles. A major dirt road and power lines run through the center of it all, providing a confident feature to re-orient oneself on. There are some delightful open forest areas of the map, where there is little underbrush, that may cause bouts of gleeful skipping. This is balanced out by the areas of low-lying blackberries on the map, that cause tripping. Lincoln Tree Farm is also a bit unique due to its 2-meter contours, instead of the traditional 5-meters. There are also areas that use form-lines, which are dashed contour lines that appear between the regular contour lines, thus providing areas with contour information for every 1-meter of elevation! 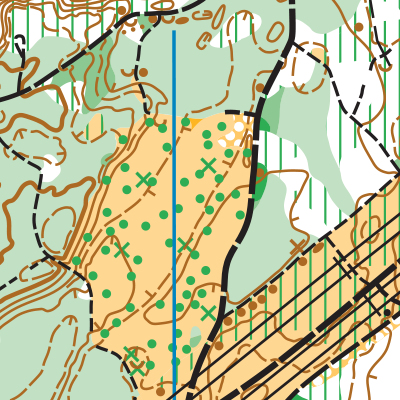 Advanced course participants will be challenged when navigating these subtle contours in the forest. 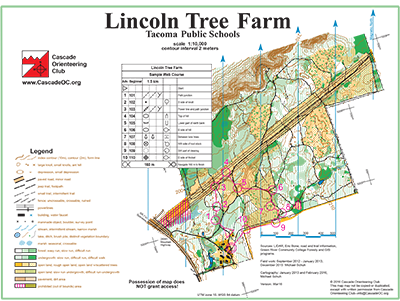 Lincoln Tree Farm poses two unique navigational challenges. First, figuring out which brush pile is yours in a sea of brush piles. Second, carefully reading the detailed 2-meter contours with 1-meter form lines between them. (The traditional standard is 5-meters). Lincoln Tree Farm is mostly rolling, with a few steep pitches here and there. Most of the trails are well-trodden, though some may be overgrown. Perhaps the most physical part of LTF is the low-lying blackberries that poke and trip you. Don’t drag your feet here! NOTE: These directions go to Cougar Mountain Middle School, since it is used as the shuttle pick-up location for events at Lincoln Tree Farm.